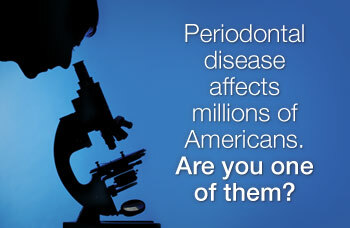 Periodontal disease affects millions of Americans. Are you one of them? The mouth is a remarkable eco-system, studied closely by researchers for hundreds of years: your own oral tissues live alongside millions of bacterial organisms, most of the time in benign cooperation. Sometimes, however, that symbiosis erupts into an all-out war known as periodontal disease. Periodontal disease refers to any disease (actually several) that affect the areas around the teeth (from the Latin “peri” – around and Greek “odont” – tooth). Periodontology is the corresponding specialty that studies these supporting structures of the teeth — including the gingival (gum) tissues, the periodontal ligament which suspends the tooth in its socket and the underlying bone to which it is attached. Periodontics is the dental specialty dedicated to the treatment and prevention of periodontal disease. The periodontal tissues are arguably among the most highly researched tissues in the body. Contributions by researchers from many fields have greatly added to our knowledge of oral as well as general health and bodily functions. While periodontal diseases may be confined to the mouth, their effect may not be: research is beginning to uncover a relationship between periodontal health and general health. Known risk factors for periodontal disease include smoking and diabetes. Evidence is also suggesting a relationship between severe periodontal disease, cardiovascular disease (heart and stroke conditions) and mothers of preterm low birth weight babies. Periodontists have developed several effective treatments to halt or eradicate many forms of periodontal disease. The most effective treatment, though, is preventive, performed by the patient. Good personal daily oral hygiene, which disrupts the growth of plaque, is the best defense against most forms of periodontal disease. There are currently over six hundred species of bacteria known to exist in the mouth alone, with only about four hundred currently identified. Van Leeuwenhoek, a Dutch scientist of the 17th century and inventor of the first microscopes, was the first to observe living bacteria, which he called “animalcules.” He observed dental plaque to be bacterial in origin and made the connection between it, oral hygiene and gum disease. Over the next four centuries, knowledge about the relationship between the bacteria-rich plaque and periodontal disease advanced steadily. Studies carried out in the 1950s and 1960s, contributed enormously to this understanding: by looking at large populations of different age groups over time, researchers found a clear but indirect association between mouth cleanliness, dental (bacterial) plaque deposits on teeth and the time that it was present. Most of the variation in disease levels could be accounted for by bacterial plaque alone, the rest attributed to other factors like diet, nutrition, bite factors and other variables. The association between smoking and periodontal disease also became apparent with smokers showing worse and more rapid bone loss than non-smokers.